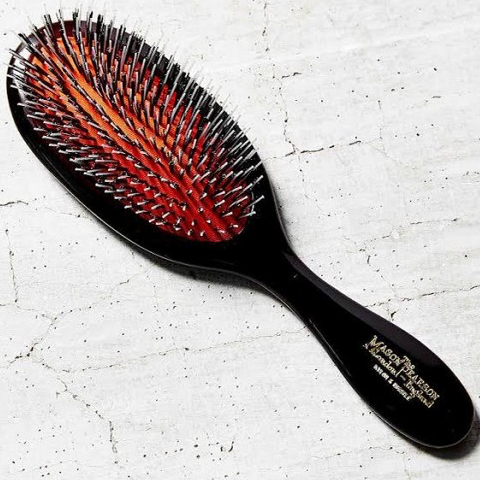 First off, the quality of the bristles is important—they detangle, polish and help style the hair. According to Jennifer Matos, stylist at Rita Hazan Salon in New York, "Higher priced brushes are made to be heat resistant. So when you’re using a $5 brush, it can actually do more harm on the hair because bristles burn and melt with the blow dryer's heat. This causes damage, which is why it’s always best to invest in a good brush—especially if your hair is colored-treated." Low quality bristles also lack polishing power, resulting in a mediocre hairstyle, according to Nicole Descoteaux, Master Stylist at Butterfly Studio Salon. A quality brush can cost anywhere from $50 to over $100. However, it is well worth the investment---it is better for your hair and will last for years. According to Jay Jackson, Senior Stylist at DreamDry in New York, "When it comes to brushes, it's the same as good shoes—don’t cut corners for cost. When you have a quality brush it's going to stand the test of time." Cristina B., a stylist at Rita Hazan Salon in New York completely agrees with this longevity aspect---“I've had some of my $150 brushes for about 5 years!" In addition, if you blow dry your hair then you need a brush with good tension and grip for shiny, frizz-free results. "One of the keys to a great blow dry is tension. A well-crafted brush with boar bristles, or a boar bristle mix, will grip your hair firmly and help polish the cuticle to a glossy smooth finish," says Christine Healy, a stylist at Rita Hazan Salon. "They also usually have a wooden handle made out of a sturdy wood, like olive—and are made using the root of the boar bristle, which is the densest and strongest part which means a firmer grip," she adds. So, like most other things you buy, quality matters and costs more. However, in the long run, the benefits outweigh the initial investment. Story courtesy of Byrdie. See it here, including the favorite brushes of the pros.